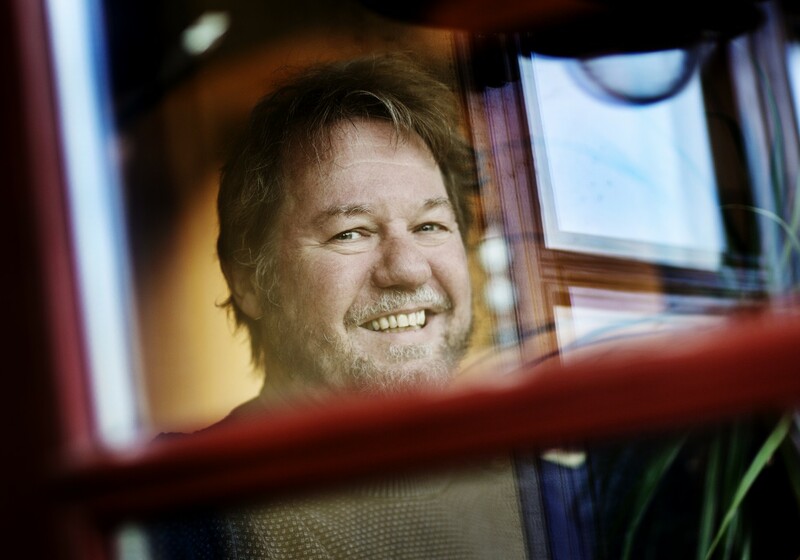 Mogens Christensen (1955-) studied with Per Nørgård, Hans Abrahamsen and Poul Ruders at The Royal Academy of Music in Aarhus and completed his studies with Ib Nørholm at The Royal Academy of Music in Copenhagen. He has been a teacher at all Music Academies in Denmark, several universities and at The Grieg Academy i Bergen. As a composer Mogens Christensen started on his path with an affinity to lyricism – beginning 1982 with a nocturnal vision in Hölderlin´s poem Hyperion – then increasingly focusing on the dreamy, quiet and yet sensual world of the Danish poet, Ole Sarvig. This distant, latently turbulent – yet at times almost fanciful – expression can also be felt in the instrumental music, which first saw the light of day in the mid-1980’s. The predominantly ethereal qualities give way to a more frequent “awareness of earthly gravity”. Likewise, the wish to build upon a more independent musical logic progressively takes over from an earlier interest in the textual possibilities. However, the sound universe remains basically the same in this new more abstract style, announced by the orchestral work Zurvan Akarana (1986-89). The spiritual affinity with the gentle art of Hölderlin and Sarvig was in the 1990’s enlarged with the bubbling, imaginative and surrealistic elements found in the novels of Gabriel García Márquez and Milorad Pavic. Nevertheless, Christensen´s music is not programme music; the essence and form of the words are only some of the starters of his musical imagination. A kind of common denominator of his music is his interest of time in music. As a composer in residence with Copenhagen Phil. (198-2001) he developed a “noisy” style using the full orchestra in pieces like Circulus Stellae, Cristalline Light and Zauberwald. As a composer in residence with Randers Chamber Orchestra (2006-08) he wrote several pieces, including af concerto for Lud and Eid. His production is rich: many solo pieces, very much chamber music, one chamber opera. He has written two violin concertos and three recorder concertos. Musical Education: Diploma in Music history and Music theory, 1977-1983 (Royal Academy of Music, Aarhus), Teaching Cerificate, 1981-1983 (Royal Academy of Music, Aarhus), Diploma in Composition, studying with Per Nørgård and Poul Ruders, 1984-1988, (Royal Academy of Music, Aarhus), Soloist Diploma in Composition, studying with Ib Nørholm, 1991-1993 (Royal Academy of Music, Copenhagen), Mmus, 1992 (University of Aarhus). Career: Since the début his music has been performed in almost all European contries, in USA (N.Y.) and in South America. Being prizewinner at the UNESCO Composers International ROSTRUM, 1994, his piece Winter Light was broadcast all over the world. Composer in residence with Copenhagen Phil (1998-2001) and Randers Chamber Orchestra (2006-08). Concertos: Dreams within Dreams (1st Violin Concerto), 1990, A Fancyer’s Delight (Recorder Concerto), 1993, Las flores del mar de la muerte (2nd Violin Concerto),1993, Liloiori (Concerto for Harp, Percussion), 1997, Middle East Scherzo (Concerto for Oud and Nei), Château d’ètoiles (Pioano Concertiono), 2006-7, Busy Birds and Bees (Recorder Concerto), 2005/13, Nordic Summer Scherzo (Recorder Concerto for Michala Petri), 2014. Choral and vocal works: Stemmer (1983), 5 Sarvig Motets (1987), Hyperions Schicksalslied (1982), Pessimisticum (1993). Recordings: Vocal & Chamber Music vol. 1 (Paula, 1991), Vocal & Chamber Music vol. 2 (Paula, 1993), Vocal & Chamber Music vol. 3 (Paula,1995), Vocal & Chamber Music vol. 3 (Paula, 1993), Vocal & Chamber Music vol. 4 (Paula, 2004), Vocal & Chamber Music vol. 5 (Paula, 2006), Music for solo Instruments vol. 1 (Paula 1998), Music for Recorder vol. 1 (Paula 1998), Systema Naturae (opera, 2001), Echos of Freamless Fragments (Dacapo 2009), Pipes and Reeds (Dacapo 2012), Busy Bees and Birds (2004) plus 13 other CDs. Honours & Prizes: Artist Prize of the County of Bergen, 1991, Artist Scholarship of the Danish State 1993-95, Prize Winner at the UNESCO Composers International ROSTRUM, 1994.